Joseph Lia (Baritone) graduated in Music from the University of Malta. Supported by the Janatha Stubbs Foundation, he furthered his vocal training at the famous St Petersburg State Conservatoire under the tuition of Prof. Sergei Riazantsev, where he obtained a Masters Degree in Voice Performance. With the support of the MGSS Scholarship Joseph read for a Doctorate Degree in Voice Pedagogy. 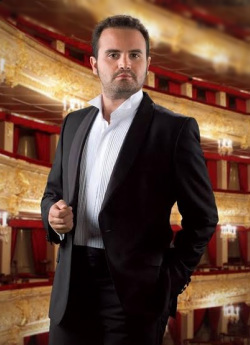 Joseph has performed the main roles of Germont in Verdi's Traviata, Uberto in Pergolesi's La Serva Padrona, Ebn-Haki in Tchaikovsky's Iolantha, Count Almaviva in Mozart’s Nozze di Figaro and Dottor Malatesta in Donizetti's Don Pasquale, while also other minor roles like Loreck in Giordano’s Fedora, Paris in Gounod’s Romeo and Juliet, Baron in Verdi’s Traviata, Fiorello and Ufficiale in Rossini's Barbiere di Siviglia, Commissiario Imperiale in Puccini's Madama Butterfly, and Marullo and Monterone in Verdi’s Rigoletto. Joseph is also an accomplished recitalist, mastering the lieder and oratorio repertoire. He has given various solo recitals, and has taken part in various international festivals including the Tallinn BachFest, Universe of Music in Moscow, Italian Opera Taormina, Ragusa Ibla Organ Festival, Alion Baltic International Music Festival, Tallinn Organ Festival, and Peter de Grote Chamber Music Festival in Holland. Last year he had the privilege to perform with the world famous tenor Joseph Calleja during the annual patron's event of the BOV Joseph Calleja Foundation. Lia has performed in venues of note, namely the Rachmaninov Hall, the St Petersburg Capella, the Glazunov Hall, Ekaterinburg Philharmonic Hall, Barnaul Philharmonic Hall, Manoel Theatre, Niguliste Cathedral, St. John's Co-Cathedral, Wienersaal and others. He also served as a judge in various competitions in St. Petersburg, coached several singers and choirs, and invited to give presentations at the Tchaikovsky Moscow State Conservatoire and Johann School of Music. Joseph Lia has been invited to give masterclasses in voice at the Vytautas Magnus University Music Academy in Kaunas, Lithuania, at the TISIA Istituto Universitario di Studi Musicale, Cefalù in Sicily and Elena Obratsova Cultural Centre in St.Petersburg, Russia. Joseph is the Founder and Artistic Director of the Malta International Organ Festival, an adviser for Europa Cantat, works for the Arts Council Malta, is a visiting lecturer at the University of Malta within the Centre for Liberal Arts and Sciences, and has just recently been appointed as member of the founding committee of the newly established KorMalta - Malta's National Choir.